The United States appeared eager to seize on commitments by North Korean leader Kim Jong Un at his talks with South Korean President Moon Jae-in even as critics said the steps did little to put Pyongyang on a course for irreversible denuclearisation. Washington/Seoul: The United States said it was ready to resume talks with North Korea after Pyongyang pledged on Wednesday to dismantle its key missile facilities and suggested it would close its main Yongbyon nuclear complex if Washington took unspecified actions. 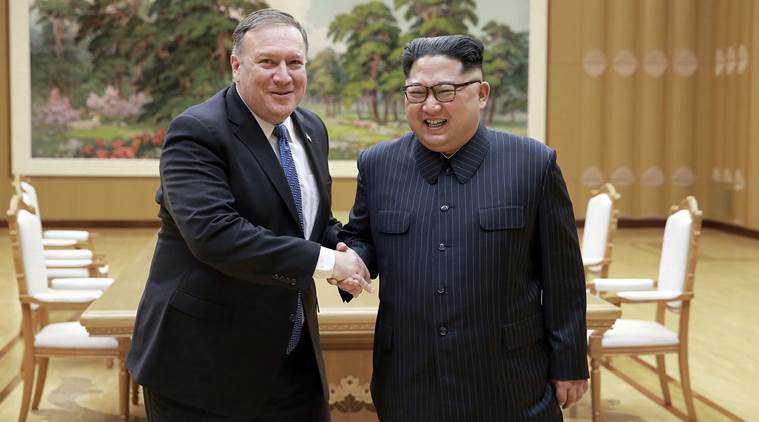 US Secretary of State Mike Pompeo said he had invited North Korea’s foreign minister to meet in New York next week, with the aim of completing its denuclearisation by January 2021, after a Pyongyang summit between the leaders of the two Koreas. The United States appeared eager to seize on commitments by North Korean leader Kim Jong Un at his talks with South Korean President Moon Jae-in even as critics said the steps did little to put Pyongyang on a course for irreversible denuclearisation. North Korea will allow experts from “concerned countries” to watch the closure of its missile engine testing site and launch pad at Tongchang-ri, Moon said at a joint news conference with Kim after their meeting in the North Korean capital. The sudden revival of diplomacy followed weeks of doubts in US President Donald Trump’s administration’s about whether North Korea was willing to negotiate in good faith after a June summit between Trump and Kim yielded few tangible results. The January 2021 completion date was the most specific deadline set in what is expected to be a long process of trying to get the North to end its nuclear program, which may threaten US allies South Korea and Japan as well as the US homeland. China, North Korea’s most important economic backer and diplomatic ally, said it warmly welcomed the agreement reached in Pyongyang and strongly supported it. “We absolutely cannot let this hard to come by opportunity for peace slip away once again,” the Chinese government’s top diplomat, State Councillor Wang Yi, said in a statement. Some US officials were deeply skeptical. Speaking before Pompeo’s announcement, two senior US officials involved in US-North Korea policy voiced fears Kim was trying to drive a wedge between Washington and Seoul. US officials suggested Kim was trying to ease the economic pressure on him to curb his nuclear programs and to undercut the rationale for US troops being based in South Korea by improving relations with Seoul. The United States has some 28,500 US troops in South Korea to deter North Korean attack. Pyongyang has long sought their withdrawal and Trump has questioned their rationale and cost. “There is nothing the North has offered so far that would constitute irreversible movement toward denuclearization, however you define that, by January 2021 or any other time, or even a reduction of the military threat it poses to the South and the region,” said a US intelligence official. “Everything that’s out there now is conditional on US actions that would reduce the pressure on the North to cooperate or (is) filled with loopholes and exit ramps,” added the official, who spoke on condition of anonymity. US officials said the ambiguity about what Washington was supposed to do for the North to close its nuclear complex at Yongbyon gave Kim room to argue that Washington had not done enough for North Korea to follow through on its pledges. South Korea’s national security adviser, Chung Eui-yong, said the reciprocal US steps could include an end-of-war declaration. South Korea and the United States remain technically at war with North Korea because the 1950-53 Korean War ended in an armistice and not a peace treaty. Despite the doubts of US officials and outside analysts, North Korea’s pledge at the summit with the South Korean president drew an enthusiastic response from Trump. Speaking before Pompeo’s comments, Trump? welcomed Kim’s pledges, calling them part of “tremendous progress” with Pyongyang on a number of fronts, and hailing “very good news” from the summit between the Koreas.